Orthodox Christians make beautiful deep red eggs for Pascha. It’s an ancient tradition, perhaps going back to the time of the apostles. The eggs, along with meat and cheese and wine, are brought to church in baskets. The baskets are blessed at the end of the Paschal services. During the festivities that follow, many people play the game that Catherine plays in Catherine’s Pascha: hitting the red eggs together to see which one breaks. Some say that the shattering of the egg represents the shattering of the gates of Hades. Others say that if your egg remains unbroken, you’ll have good luck for the year. So why are Pascha eggs red? The truth is that nobody knows for sure. They just are. But if you don’t like that answer, there are plenty of others! My favorite story about the origin of the red eggs involves Mary Magdelene. It is said that, when she went to Rome, she arranged an audience with the Emperor Tiberius. As she spoke about Jesus, about his death and resurrection, she picked up an egg from the table. Perhaps she used it to illustrate the stone that had sealed the tomb. Perhaps she was just fidgeting with it. Whatever the reason, she was holding the egg and telling Tiberius about the Resurrection. And at that point, Tiberius had had enough: “A man can’t come back from the dead any more than that egg in your hand can change from white to red!” And as he spoke those words, the egg in Mary’s hand changed from white to red. Mary held the egg up for all to see, saying, “Christ is risen from the dead!” And so, in honor of her, and in honor of the Resurrection, Christians have dyed eggs red at Pascha ever since. So that’s one story. 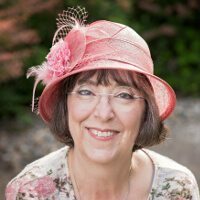 According to another story, one of the women disciples, like Thomas, didn’t believe it when she was told that Jesus had been raised from the dead. Thomas said, “I won’t believe it unless I can touch the wounds on his hands and put my hand into his side.” The woman said, “I won’t believe it unless all the eggs in this basket turn red.” And, in that story, all the eggs turned red. It appears, from historical sources, that eggs were first dyed red at Pascha by Christians in Mesopotamia, perhaps as early as the second or third century. From there, the tradition spread to Greece and then throughout the Christian world. At that time, Ukraine already had a strong and ancient tradition of making intricately decorated eggs, called pysanky. When the tradition of making red eggs for Pascha arrived in Ukraine, people did not quit making pysanky. Instead, they adapted their existing customs into the celebration of Pascha. You can learn to make pysanky, but it’s a lot easier to make red eggs using onion skins! It’s easy to make traditional red eggs for Pascha using onion skins and vinegar. These natural ingredients are safe, and they make eggs that are a beautiful deep rich red. * You can save onion skins all year. Keep them in a zip-top plastic bag in the cabinet or freezer. A gallon bag full of onion skins makes plenty of dye for a batch of eggs. If you didn’t save the skins, just ask the folks at the produce department at your local grocery if they’ll give you a bag of onion skins. It’s traditional to dye Pascha eggs on Holy Thursday. You’ll want to start early in the morning. Fill the pot with water. Push the onion skins down into the water so that they’re wet and not floating on top of the water. Bring the water to a rolling boil, then turn the heat down to a simmer and cover the pot. Remove the kettle from the heat and let it stand until it reaches room temperature. While the dye is cooling, take your eggs out of the refrigerator and let them come to room temperature. Pour the dye through a mesh strainer into a large bowl or another kettle. Discard the onion skins. Place your clean, uncracked, raw, room-temperature eggs in a single layer in the kettle. Pour the room-temperature dye over the eggs. Make sure the eggs are covered with at least two inches of the dye solution. Add a tablespoon of vinegar to the water. Gently bring the eggs to a boil. Let the eggs boil for one minute, then put a lid on the pan and take the pan off the heat. Let the eggs sit, with the pan covered, until they’re cool. The eggs will cook completely as they sit. Check the color of the eggs. If it’s not deep enough red to suit you, put the pan with the dye and eggs in the refrigerator overnight. Take the eggs out of the dye and let them dry on a rack. 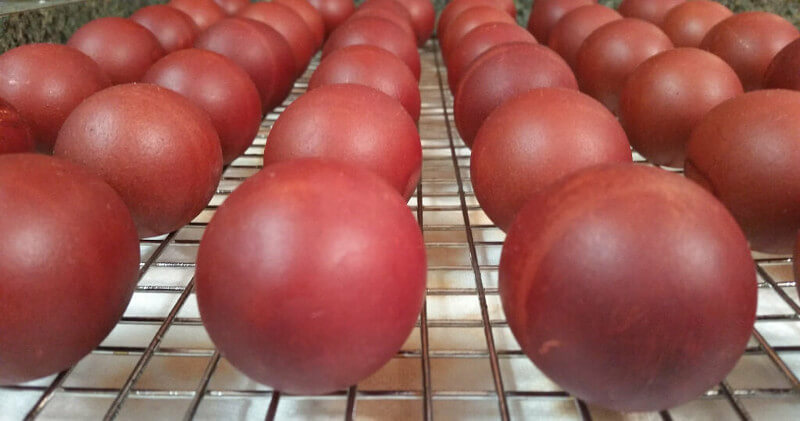 When they are completely dry, polish the red eggs with a soft cloth and a little bit of olive oil. How Easter got its name: It wasn’t named for a pagan goddess. Learn the true story of how Easter got its name. As a little girl, my Mom, Matushka Jean, would dye eggs this way for the church congregation. It took a lot of time. They were handed out after the midnight Easter Liturgy. I thought they were so beautiful – like little red jewels nestled in the straw in this huge basket.